Let's add your fair or festival to this list. When you book entertainment for your fair, you not only have a list of what you want from an act, but a very firm list of what you don’t want. In short, you want an act that is something that your guests will enjoy, while causing you as few headaches as possible during the event itself. C.J. Johnson fits that bill perfectly. Let’s be honest. There are dozens, possibly hundreds, of hypnotists that sell their shows to the fair market. Some are excellent, some are outstanding, some of them are outright awful! Some are incredibly expensive, some of them are incredible bargains and some of them are “cheap” (see: "some of them are awful!"). C.J. packs them in, makes them laugh and brings them back again and again. • A great show. First and foremost, you’ll get great shows that are hilariously funny, yet squeaky clean so that grandma Jones won’t be offended when she walks by on the way to the quilting exhibit. • A Money Back Guarantee. That’s right, a money back guarantee. If for any reason, within CJ’s control, you are not pleased with his performances, you don’t have to pay him! No other act in the Fair business is offering this kind of “money where your mouth is” promise. • Competitive Pricing. C.J. 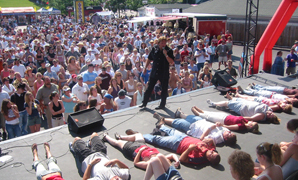 is an old pro at hypnosis, and has appeared at many fairs & festivals during his career. He knows how to grab a crowd, and how to hold them. • He'll be one of the big variety draws at your event! • Discounts available: If your fair is 10 days or longer you can take advantage of extra discounts. If you book both C.J. Johnson – Comedy Hypnotist AND one of our "Game Shows To Go"! • Easy to work with. C.J. provides his own technical needs for the show via remote control music cues, so there is no need for a sound technician during his performances. He can also provide his own microphones and even the PA system if needed. • A great show. I know, that’s the first thing on the list, but hey, isn’t that what you really want to be sure of? What’s the difference if we’re easy to work with and have great pricing unless you also get a great show.